In Yes! 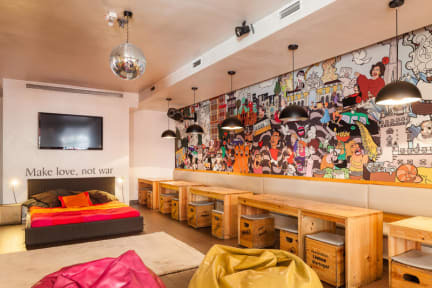 Lisbon Hostel you can relax, have fun and party in the lounge and bar and then get a good night's sleep in our quiet and comfortable rooms. The next day you'll be fresh as a daisy, ready to explore Lisbon's most important attractions, all within walking distance! Travelling alone? Don't worry; you'll meet loads of people in our lobby and at our special events, like the Free Walking Tours, Pub Crawls and the Famous Dinners! Our location is simply the best in Lisbon! Save money walking everywhere. We are near Praca do Comercio, Rua Augusta and Baixa Pombalina. Near de historical and comercial districts of lisbon, near the design museum. Book now for the best hosteling experience in the world! Incredible place! Could not say a bad word about this hostel, the staff, the food and the people were so amazing. Great hostel, perfectly located. Beds are clean and comfortable and come with a privacy curtain which is very welcome. Showers are hot :) staff are amazing and the activities (walking tours, group dinners - definitely do the Sintra day tour!) are a great way to meet new people if you’re travelling solo. The best hostel I’ve ever stayed at! The staff are constantly energetic and helpful. I absolutely loved the family style dinners. Everything was super clean and always felt very safe. Amazing location! Great breakfast! I’d recommend this place to everyone! One of the best hostels I have ever stayed at in my life. The dinner is real value for money, the beds are comfortable and the bathrooms were always clean and spacious!! The hosts were great. Shout out to Fabio who was the best host I've had! The location is good, close to restaurants, shops and the sights. And they honestly have so many activities for you to do that you will never be bored. I met some great people here and will never forget my stay. I had an amazing time at this hostel. Its a really good pick for anyone travelling alone; they do good cheap events out of the hostel that helps you meet other travelers. The location was amazing, very central Lisbon and close to the beach. Had an amazing time here! Bed was super comfy, shared areas were great and breakfast for just 2€ was perfect. Walking tour is well worth doing and I loved the Sintra tour too - you get to see so much more than just the palaces! Pub crawl wasn't great but the hostel has such a brilliant atmosphere, full of people who want to socialise, that you have people to drink and explore with every day and night. Would love to come back here! Great hostel. Stayed in the superior dorm which was amazing, very private beds and spacious room. The dinner with two hours unlimited wine beer or sangria for 10 euros was amazing, tasty food and get value bottomless alcohol - very impressed. Would stay again. I loved Yes! Hostel. The dinners made it very easy to meet people so it would be a great place to stay if you’re traveling alone or just looking to meet new people while traveling. They also give you a lot of food so it’s definitely worth the 10€. My only complaint is that the top bunks do not have privacy curtains like the bottom bunks. Everyone was super nice and there was a problem with my reservation; however they immediately solved the problem. I will just suggest to include more fruit in the breakfast.